mctavish4 wrote: Can it convert 6.60 to 6.62? and if so, how do I do that? Any 6.60 CTF should work on 6.61 as nothing VSH related was changed. 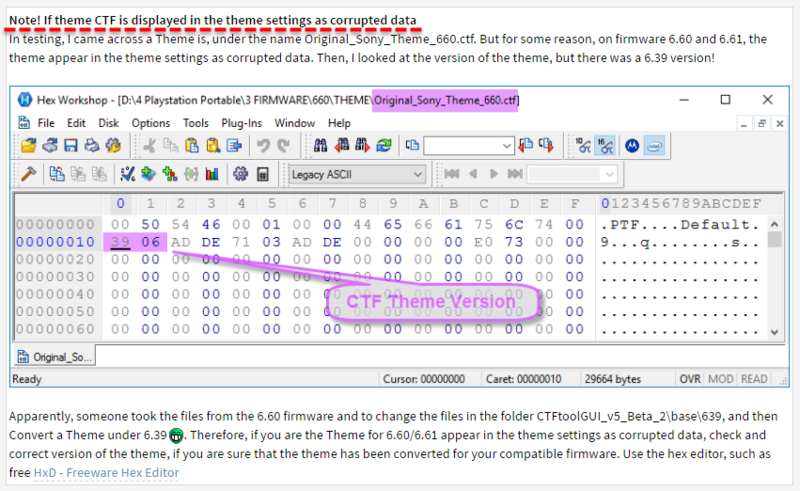 CTF Themes 6.60 work on 6.61 on latest 6.61 cxmb support. Last edited by Butcher on Sat Feb 25, 2017 8:59 pm, edited 2 times in total. All Themes CTF 6.60 works perfectly on 6.61 with the latest version "CXMB UNIVERSAL: 3.71 - 6.61 CLASSIC & 6.61 INFINITY"
Read carefully the first post. And do not forget to look into the spoiler at the end. But Erik, I do not see anything labeled as a spoiler in the first post unless you mean the note which in itself doesn't make any sense to me. I have installed and re-installed CXMB Universal but I can't get any Theme's to work except the default ones. The Themes show but when I tell it to apply them I constantly get an error code. The conf.txt path never changes on it's own from /PSP/THEME/default.ctf either. Also, ms0 doesn't appear at the beginning of this line. I have read and re-read the first post but I cannot tell what I seem to be missing. Could you please point out to me what I am missing. I'll go back and re-read but all I can gather from it is that all of Theme should run and the single core thing but then the NOTE seems indicate differently. Is the NOTE the spoiler you are talking about and if all of the Theme's 6.60 and 6.61 should work, why would there be the need of a spoiler line? To me a "spoiler" line indicates that something doesn't work the way it should but you seem to be saying just the opposite. Anyway in another forum someone said that they got the work around solution for the conf.txt I think from this forum. I will definitely go and re-install Universal CXMD and give it another try but honestly I've done this over and over only to get the same error with the Theme's. Erik, this GTFTool just refuses to work on my PSP3000. I have right clicked and said for it to convert some 6.20 themes and 6.39 themes and the theme over to the PSP and I have tried in various ways to do this. Do I also need to use the Sony Conversion Tool or something. I can get the icom of a theme to appear on the PSP under Theme and then I select reply and all I get back is "An Internal Error has occurred" error 80108351. I Have tried for about 5hrs tonight. Either something went wrong on the infinity installation in but it all worked according the plan and I can install eboots but this just isn't working. One thing I'm confused about also is that I have installed the CXMB UNIVERSAL 3.71-6.61 Infinity only to have the CTFTool re-write the CXMB on it's own and keep putting it into the root folder. When I answer no to that question it cancels the whole Theme transfer over to the PSP. There is nothing else at this point that I can see trying differently than I already have. At one time I did get the classypink.ctf icons to turn pink but the background stayed the same default color so I thought well I should send the ptf file over as well as that may be for the background. After that it all use went further downhill as I couldn't from there on out get any of the themes to even show up. Has anyone here had this same problem as I have? Since nobody has mentioned it I guess it has all gone hunky dory for everyone else. I think I saw something about a BETA 4 out for the GTFTool. Sometimes you just have to know when to give up I guess. I'll just go back to 6.61 and keep doing the recovery mode. Sorry, Erik but I'm tired of this spoiler alert I keep getting. Not worth it anymore. Last edited by fate6 on Mon Mar 06, 2017 6:10 pm, edited 1 time in total. A spoiler - is a hidden drop-down text. You can find out and check how it works. For example, write and highlight the text. Then click in the editor - BBCodes and click the word spoiler. If you did it yourself at least once, then for sure you would not have to write so much about this spoiler. Skimbo wrote: Anyway in another forum someone said that they got the work around solution for the conf.txt I think from this forum. This was just before the new plug-in "CXMB Universal Classic and Infinity" was released. Now forget about it and do not remember or remind. Skimbo wrote: One thing I'm confused about also is that I have installed the CXMB UNIVERSAL 3.71-6.61 Infinity only to have the CTFTool re-write the CXMB on it's own and keep putting it into the root folder. When I answer no to that question it cancels the whole Theme transfer over to the PSP. Therefore, my development was continued without the source code. The addition of converting old themes to 6.60/6.61 was carried out by reverse engineering and other hacking tools. Therefore, sometimes something can not be converted as intended, for example, sometimes you can not convert the Themes in reverse order, namely from 6.60/6.61 back to 6.39/6.35/.../5.00. And also, the program did not make any changes to transfer files and old plugin CXMB to the PSP. Therefore, you need to convert the themes on the computer, and then copy them to the PSP manually. And as we know, the old plug-in had the following path: ms0:/cxmb/cxmb.prx. That is, before the old plug-in was in the root of the memory card. Stop with the multi posting, If you have something to add then edit your last post unless its been at least a few hours.